Every week we pull together some great Canadian recipes from food bloggers around the web featuring one main ingredient or dish. This week bring on the summer entertaining with 15 Canadian summer cocktail recipes! Summer is the season for entertaining - especially outdoors. And entertaining means cocktails! We've put together 15 light and refreshing summer cocktail recipes that you can stir or shake up for your next gathering. And if you subscribe to our Food Lovers newsletters, we'll be sharing 6 more cocktail recipes that you can try this summer (subscribe details are below!). 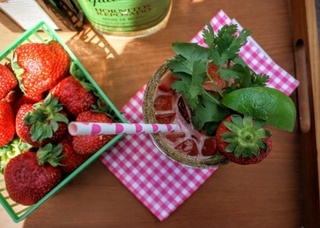 **[Strawberry Cilantro Margaritas](https://leafycauldron.net/2015/08/08/strawberry-cilantro-margaritas-vegan-gluten-free-and-soy-free/)** from **The Leafy Cauldron**. **[Mixed Berry Mojitos](http://thecookiewriter.com/mixed-berry-mojitos/)** from **The Cookie Writer**. **[Blood Orange Campari](http://www.alifewellconsumed.com/blood-orange-campari/)** from **A Life Well Consumed**. **[Paloma Mimosas](http://crumbkitchen.com/paloma-mimosas/)** from **Crumb Kitchen**. **[White Citrus Sangria](http://justinecelina.com/white-citrus-sangria/)** from **Justine Celina**. **[Fresh Strawberry Mojitos](http://foodnouveau.com/recipes/fresh-strawberry-mojito/)** from **Food Nouveau**. **[Rhubarb Tom Collins](http://www.unassaggio.com/2016/06/04/rhubarb-tom-collins/)** from **Un Assagio**. **[Raspberry Lime Smash](http://bethdunham.ca/updatesnews/2015/5/23/raaspberry-lime-smash)** from **Beth Dunham**. **[Cucumber Celery Mint Gin Rickey](http://immigrantstable.com/2016/06/02/cucumber-celery-mint-gin-rickey/)** from **At The Immigrant's Table**. **[Canada Day Sangria](http://www.foodookitchen.com/food/2015/6/30/canada-day-sangria)** from **Foodoo**. **[Italian Spritz](http://www.baconismagic.ca/italy-2/spritz-cocktail/)** from **Bacon is Magic**. **[Herbal Homestead Gin & Tonic](http://www.simplebites.net/herbal-homestead-gin-tonic/)** from **Simple Bites**. **[Campari Spritzer](https://amandaorlando.wordpress.com/2016/06/05/campari-spritzer/)** from **Everyday Allergen-Free**. **[Strawberry Bellini](http://sweetrevelations.net/2016/06/04/strawberry-bellini/)** from **Sweet Revelations**. **[Blueberry Gin Fizz](http://toughcookieblog.com/blueberry-gin-fizz/)** from **One Tough Cookie**. RELATED: 23 Sticky Bun Recipes - For Ooey Gooey Satisfaction! A big thank you to all our FBC Members who participated in this weekend's cocktail recipe roundup.